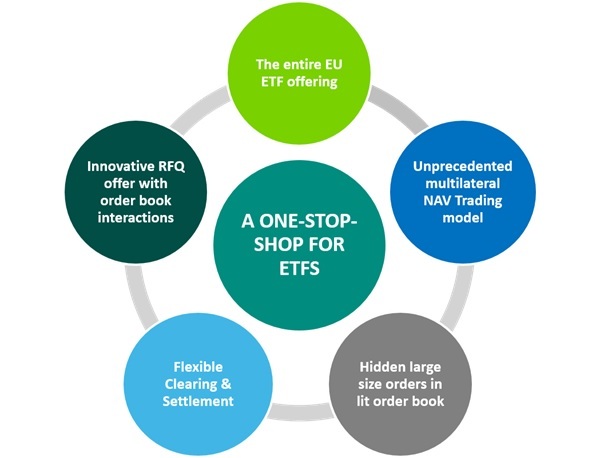 To answer the needs of a fragmented and opaque ETF industry, and to meet increasing investor demand, Euronext will provide all European listed ETFs available for trading on a single pan-European platform designed in partnership with the ETF industry: Euronext ETF Access. This MIFID II compliant one-stop shop platform will combine standard order book, RFQ and NAV trading, and reunite all market participants. It will increase liquidity, improve operational efficiency, lower transaction costs, boost transparency and provide an alternative to trading OTC, to help achieve best execution with ease.